Only 6 days and "a wake up" and I'll be on the plane headed to Houston! Yippee!!! I can't wait. Today I have a list 2 miles long...if I get it all accomplished - well.... let me tell you... it will be a miracle! However, it is always best to start the day with a plan in mind!.. What are your plans for the weekend? I don't think we have any!! What's with that? YIPPEE!! Those are the best. Yesterday at Cinnamon's I took my computer and worked on getting new designs into my EQ system. 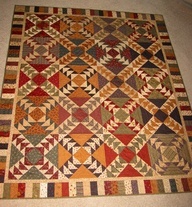 One of them I love... it's of an old antique quilt... I've made a few changes but I think it will be stunning. 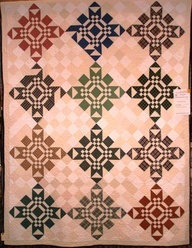 There is just something wonderful about a quilt FULL of flying geese! Don't you think? I simply adore them. The colors in this one are so wonderful! Have you ever made a quilt full of geese? I haven't and I'm sure anxious to make one! This is something else... I think the block is wonderful...but the alternating blocks is what caught my eye. Isn't it cool how they made them from tone on tone fabric with all those squares? It adds a bit of texture to the quilt versus having a huge block of plain fabric in these areas. See the error on the quilt? the top row, center dark blue block...bottom corner. They have one of the 1/2 square triangles turned wrong. Man... don't you bet they are hating life! I can sssssoooooo relate to this!! This is one of my favorite designs by Primitives by Lynda (Lynda Hall). 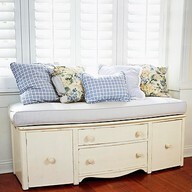 I just love black checked fabric...then when she added the sunflowers and crows.... that was the cream on top! Thanks Lynda for such super designs!!! 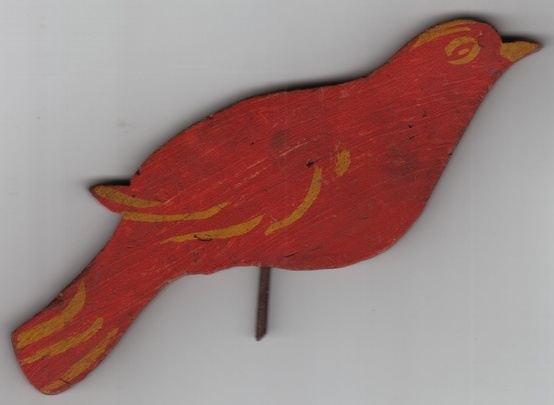 These type of folk art primitive birds are some of my favorites...isn't he cute? I sure could tuck him inside a plant here in the house and he would look right at home. I bought a cute chicken kind of like this the other day and "my Jack" was making fun of him! He just doesn't see the beauty in things like I do! Silly boy!! Wow...what a great idea. This used to be a sideboard and/or dresser. They've removed the legs and made a stuffed cushion for the top with some attractive throw pillows. 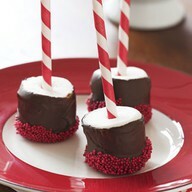 These Christmas goodies are adorable.... this top picture are those GIANT marshmallows dipped in chocolate with sprinkles. 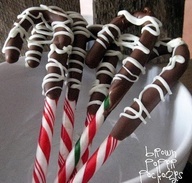 You are to use these when stirring up your hot chocolate! YUM!! Then...these are pretty darn wonderful with hot chocolate too!!! Oh heck... I would just eat the thing! Nothing better than chocolate and peppermint. I saw an ad for York Peppermint Patties on tv the other night...well... I would have killed for one! Those things are right up there on "My Favorites" list!! 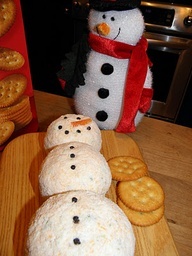 Then... let's get a little creative with our cheese balls this year when entertaining! How about 3 different types of cheese balls on one tray? Better idea yet! Simply use some raisins and a small piece of orange rind and your snowman will come to life! This is our funny for the day! What a hoot!!! I burst out laughing with this one! 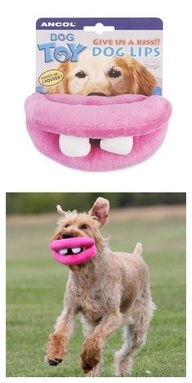 Can't you just see your pooch running to you with these funny lips/teeth in their mouth! To Darn Cute!!! Everyone have a super weekend... I sure plan too! Teaching at Cinnamon's then getting some more of my projects finished! YIPPEE!!!! !